The above galleries contain a sampling of some of the Appalachian, Shaker and Nantucket baskets I have made nearly 35 years of basket making. I also collect Native American baskets as well as baskets made by well-known contemporary fiber artists. While I do sell some of my baskets on occasion, the baskets in the above galleries are almost all one-of-a-kinds for me, so are not for sale. I hope you enjoy looking at my creations and collection, if you have any questions or comments please feel free to contact me at the address below. I am happy to announce, due to popular demand, I offer a deluxe portable floor weaving stand for anyone who weaves Nantucket, Shaker or any style of basket woven on a mold. Each weaving stand is individually made of solid maple and steel construction. 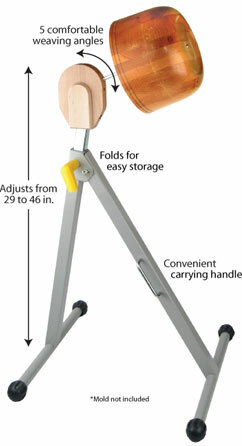 The stands are adjustable from a comfortable seated height of 29 inches all the way up to 46 inches tall. Five different mold positions allow for the perfect weaving angle. Why be tied to a weaving stand clamped to a table when you can now weave wherever you want, in the living room, on the patio or whenever the mood strikes you? Click here to download an order form today. Get yours now or add one of these great weaving stands to your birthday or Christmas list. Check out the website for my parents' store Jim Stubblefield Furniture.